Editorial board members Patrick Dempsey, Elise Covert, and Brittany Willwerth with the 76ers' Mike Muscala '13. Photo Courtesy of Patrick Dempsey. On the morning of Jan. 7, a 27-year-old from the suburbs of the Twin Cities in Minnesota walked into a training facility in Camden, N.J. to get ready for basketball practice. Equipped with pristine resources, including two regulation-size NBA courts, a training room, hydrotherapy pools, Gatorade fuel bars, a players lounge, a restaurant, and more, the 125,000 square-foot Philadelphia 76ers practice facility is nothing short of spectacular. Mike Muscala ’13 certainly never imagined himself there; if you had asked him in high school what basketball league he would be playing in at age 27, he may have suggested a men’s YMCA league somewhere, although he definitely would not have told you the NBA. 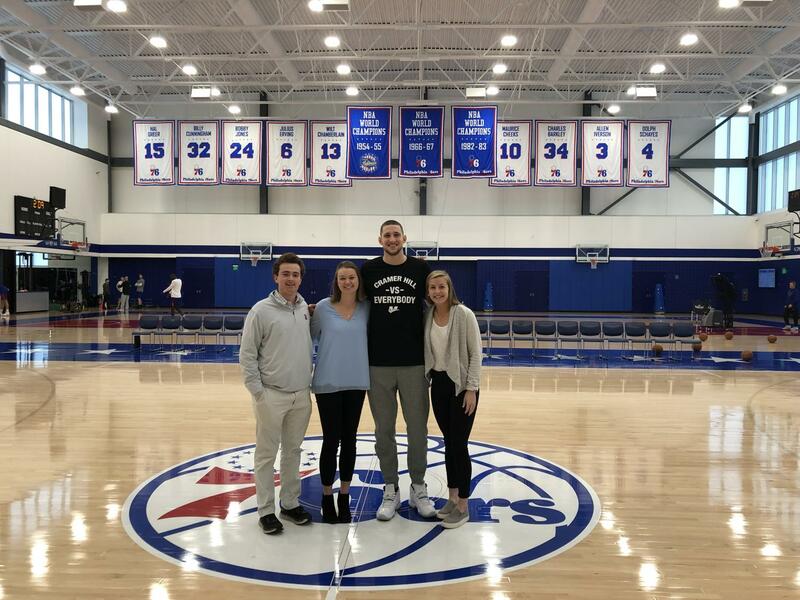 Bucknellian Editorial Board members Elise Covert ’20, Patrick Dempsey ’20, and Brittany Willwerth ’20 were fortunate enough to sit down with Muscala following the team’s practice on Jan. 7. From covering his time as a Bison and his NBA career, to bonding over classic student experiences such as Cafsgiving, Muscala portrayed nothing but class and confidence. Muscala, the Bison men’s basketball team’s all-time leading scorer, began building his basketball career at Roseville Area High School in Minnesota. After committing to Bucknell on August 18, 2008, the 6’ 11” Sixers center developed into one of the best players in the Patriot League. A four-time All-League selection and two-time Player of the Year, Tournament MVP, and Patriot League Scholar-Athlete of the Year, Muscala was no stranger to accolades during his collegiate career. Carrying with him an incredibly successful legacy as a Bison, Muscala was selected by the Dallas Mavericks as the 44th overall pick in the 2013 NBA draft and was traded that same night to the Atlanta Hawks. After briefly playing professionally in Spain, Muscala soon became the first Bison alum to appear in an NBA game when the Hawks purchased his contract back from his Spanish team. Out of all the countries in which to play abroad, Muscala was well prepared to play in Spain. After studying Spanish as his major at the University, he found a use for the language immediately after graduation. In fact, Muscala remembers one of his favorite Spanish professors at the University very well. But Muscala’s basketball journey started long before draft night. When asked about the individuals who made the biggest impact on his basketball career while at the University, Muscala emphasized the role of his Bison coaching staff: Coach Dave Paulsen, Coach Dane Fischer, and Coach Aaron Kelly, all of who are now coaching at George Mason. After witnessing Muscala’s profound success in the Patriot League, the coaching staff encouraged him to consider a career in the NBA during his senior year. In discussing his transition from the Patriot League to the NBA, Muscala emphasized the difference in tempo and overall environment. As a role player coming off the bench, he contributes steadily each night to a team that currently is ranked fourth in points per game in the league. As calm, cool, and collected as Muscala seems on the court, there are times even he admits that he stops in the moment to appreciate the journey that has taken him to this elite level of a sport. “There have been certain times in games that I look around and realize how unbelievable it is that I’m in this situation,” Muscala said. With this sort of reflection comes an appreciation for the young athletes developing behind him. For such athletes, Mike described the advice he would give to a growing Patriot League player. Along with forming meaningful relationships with teammates, he emphasized the importance of staying focused on the present. “Embrace the fact that you are going to be through some ups and downs throughout your four years, but ultimately when you look back you are going to be really glad you went through it. Focus on the moment and the rest will sort itself out by the time you graduate,” Muscala said. Muscala’s journey to the NBA serves as one that can inspire numerous young Bison athletes—a true story of determination, persistence, and passion. In describing his overall favorite memory of the school, his reflection was simple. “It’s a culmination of a lot of small things that adds up to create so many memories,” Muscala said. For him, it was these small moments that made being a student-athlete so meaningful and being a Bison so special.